If your job requires you to stay on your feet all day, you’re no stranger to foot and leg pain. While sore limbs and fatigue may seem innocent enough, that discomfort can quickly turn into lasting issues and injuries. Extended periods of standing and walking increases the stress put on your muscles and joints. Unfortunately, most people don’t have a choice but to work on their feet. While it may be another part of the job, you don’t have to settle for pain and discomfort. 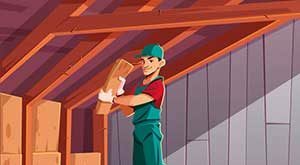 Here are some great tips to help you reduce leg and feet issues on the job and after you clock out. The first step in keeping your feet safe and protected is to wear the right footwear. Your shoes can have a drastic effect on your feet. Uncomfortable or ill-fitted shoes don’t provide you with an adequate amount of support. They may affect the way you walk and drive the force of impact from each step right up your leg. Needless to say, it’s important to take time in selecting the right shoes. 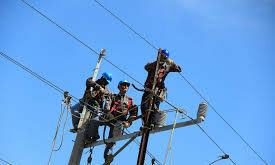 There are a many great work boot options out there. 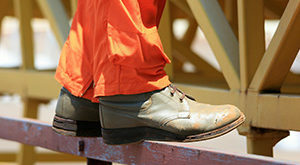 It’s a good idea to match your footwear to your particular job. 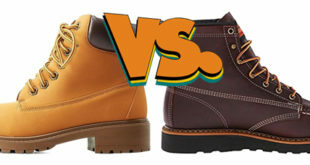 If you work in construction, go with leather boots that have the protective features that you need. If you work in a kitchen, go with boots that have an anti-slip sole. Your shoes should also have good arch support and shock absorption features. When it comes to fit, it’s recommended that you find shoes that utilize laces. The shoes should fit snugly around your feet with no sliding or chaffing. Another thing you should be wary of is the condition of your shoes. 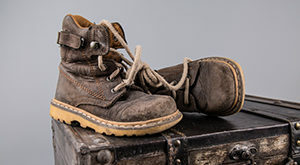 Work boots are put through a lot during a normal workday. They can start to deteriorate and lose their protective qualities. Not only does this put you at risk for injury, but you’re more likely to experience foot and leg pain. Your footwear should be replaced every six months if you wear them everyday. Insoles can give you even more comfort and protection. Some work boots come with high-quality insoles built right in. However, you can also purchase insoles separately or get products custom made to your unique needs. 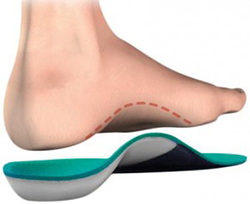 Insoles and custom orthotics are designed to prevent potentially painful foot and leg issues. These include plantar fasciitis, shin splints, and much more. Orthotic accessories can be inserted directly into your shoes. They support your arch and help to spread out pressure as you walk. Many also absorb the force of impact with each step so that it doesn’t affect your body as much. If it’s possible, changing your position on a regular basis throughout the day can make a noticeable difference in your comfort levels. Standing in one spot for prolonged periods of time will make you feel fatigued much faster. Try going for a walk or shifting your weight from one foot to the other every few minutes. Of course, it’s always a good idea to get off your feet every once in a while if you have the opportunity. Even if it’s just for a minute or so, your feet and legs will feel much better. There’s nothing better than starting your morning off with a good stretch. Your feet can benefit from stretches as well. This helps to warm up your muscles so that they’re not as susceptible to injuries. With regular stretching, you can also increase the range of motion in your feet and strengthen the muscles. Stretching is very easy to do. One of the easiest methods is to simply sit on a chair and cross one leg over the other. Then, use your hand to pull your bare foot towards you. Another great technique uses a tennis ball, water bottle, or foot massager. Place the item on the floor and put your foot on top of it. Now, gently roll your foot and apply light pressure to relieve tension. This stretch may also benefit you during the day whenever you start to feel fatigued. The final stretch technique can be done on a wall. Place your heel a few inches from the wall and lift your foot so that the ball of your foot is on the wall. Then, lean into the wall. You’ll feel the muscles under your foot stretching. You work on your feet all day, so why would you want to perform foot exercises? Well, stronger muscles in your feet do more to keep you safe and comfortable. If your feet are strong, they’ll be able to handle the stress that you put them through each day. The feet have a lot of small muscles that work to keep you stable as you walk. Giving them a good workout can prove to be very beneficial. Foot exercises are very simple to perform. One exercise uses a regular towel. Simple place the towel on the floor and use your toes to scrunch it up towards you. Alternatively, you can see the same results with a bowl of marbles. Empty the marbles on a carpeted floor and use your toes to pick them up and place them back into the bowl. One of the biggest problems with staying on your feet all day is that blood has a harder time making it back to your heart. Blood can start to pool in the feet and lower legs. This leads to swelling and pain. To prevent these types of issues, you’ll need to help your body circulate blood. The easiest way to do this is with compression socks. They’re designed to push blood back up the legs so that it can be recirculated by the heart. Another way to improve circulation is to simply get off your feet. During your break, you can elevate your feet. Blood will instantly start to rush back up your body. When you clock out for the day, you shouldn’t ignore your feet. They still need to be supported and protected. However, the first thing you should do is relax. Kick up your feet to improve circulation and let your feet recover after a long day. If you’re experiencing significant pain, there are a few things you can do to get quick relief. The first treatment option is a simple foot massage. You can use your hands and a bit of massage oil to get relief. Use your fingers to apply pressure on tight spots. This will reduce tension and increase blood flow. Another option is to apply heat and ice. This is best if you’re experiencing swelling and pain. Set up two small water baths. One should have ice water while the other should have hot water. Simple stick your feet in for a few minutes and alternate between the two. This helps to pump out pooled fluids and reduce swelling. Finally, you can take a bath with Epsom salt. Epsom salt quickly dissolves into bath water and breaks down into magnesium and sulfate. Your body will absorb these minerals as you soak in the tub, resulting in decreased pain and swelling. You don’t have to settle for foot and leg pain. If you spend your days on your feet, you need to take the necessary steps to stay comfortable. With these tips, you can experience less fatigue and decrease your chances of suffering from any lasting issues.